Geno Smith headlines an admittedly weaker 2013 NFL Draft class, especially in comparison to the star-studded 2012 rookie class. The University of West Virginia quarterback slipped in the 2013 NFL Draft despite a huge Senior season. Widely considered a first round pick, Smith was not selected until early in the second round by the New York Jets. Geno Smith was not even the first quarterback taken, ceding that honor to EJ Manuel, who was taken 16th overall by the Buffalo Bills. 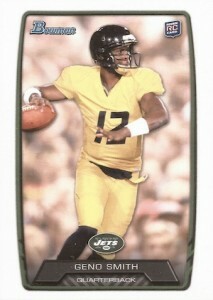 Despite this, Geno Smith rookie cards remain a top 2013 option for collectors. Geno Smith was expected to immediately compete for the top QB spot, a lackluster preseason did him no favors. He was not cemented as the week one starter until the incumbent, Mark Sanchez, went down with an injury late in the preseason. Now the pressure will really begin to mount for the young Jet as few markets have the same media scrutiny as New York City. A rookie quarterback combined with limited offensive weapons and the bright spotlight of the Big Apple, likely insures Geno Smith will be in line for a roller coaster season. Only time will tell how far Geno Smith can go. Expectations will be a little more realistic given his draft selection and the current situation of the team, but if he does not adapt quickly to the NFL game, there is no guarantee how long the coaches and team management will stand behind him. This will be doubly true if current head coach, Rex Ryan, is fired. Regardless of the uncertainty, Geno Smith is still the starting quarterback of the New York Jets as a rookie, and that will always attract the attention of collectors. Strong potential and a general lack of other top rookie options across the league will keep Smith on the collecting radar for as long as he sees playing time. 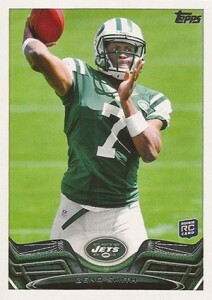 As the NFL season begins, the majority of Geno Smith rookie cards are currently base cards. Once more products are released, a variety of prices levels will begin to build for the rookie quarterback. Please note, this is an ongoing list that will be added to as more 2013 football card sets are released and Geno Smith has more rookie cards. 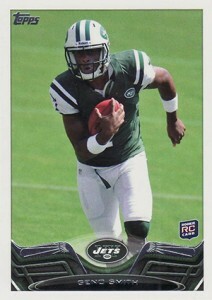 Being among the first official rookie cards has its disadvantages, as evidenced by the photoshopped image of Geno Smith. Despite this unfavorable aspect, these cards are generally a good budget option for collectors and the various parallels are popular options. 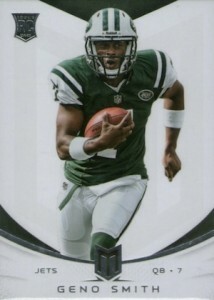 2013 Certified gives collectors another Geno Smith base rookie card with a higher print run. The deign is heavy on foil, which does highlight the image of Smith, but washes out the rest of the card. 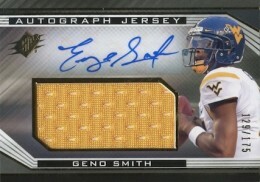 Although not his true rookie card from Certified, the base Freshman Fabrics Signatures card for Geno Smith will likely be his most preferred card from this product. Even with the sticker autograph, the mid-size jersey piece and lower print run of 399 make this an appealing option. The base rookie card is shown below on the left and the Freshman Fabric card is on the right. 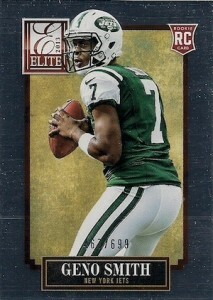 With a more elegant and timeless look, the Geno Smith Elite rookie card is numbered to 699. Although on the higher side, this still represents one of the few numbered base rookie cards. The foil border is very prone to scratches, smudges and fingerprints. Finest is normally a fan favorite because prices are reasonable and the brand recognition is very strong. 2013 Finest Football utilizes a silver honeycomb design, which pairs nicely with the Jet green. This will remain as one of Smith's preferred budget to mid-level rookie card options. 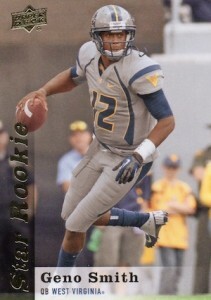 Although 2012 Momentum Football featured autographed jersey cards as the official rookie option for collectors, 2013 Momentum went the base rookie route. If you are looking for a cheap card with a simple design, this might be your best bet. Among several parallels, acetate Clear Cut parallels are an intriguing addition. 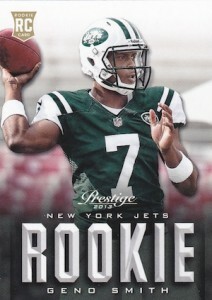 Featuring a bold design that people seem to love or hate, 2013 Prestige also showcases a variation card for Geno Smith, among others. The base version includes an action image of Smith, while the variation includes his draft day photo. 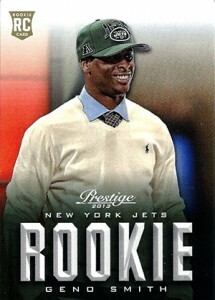 Prominence is another simple Geno Smith base card option for collectors. Panin almost achieves an Allen & Ginter effect with the plain design and finish. Similar to Prestige, Rookie and Stars does not normally win style points. However, the extensive parallels keep collectors interested. Going the nostalgia route, the low-priced 2013 Score Football pays homage to the popular 1989 Score Football design. 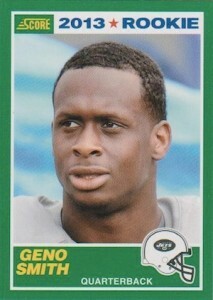 The Score Geno Smith rookie card presents a nice change of pace for collectors. As a rookie card in the flagship Topps Football product, this is among the top base rookie card options for casual collectors and set builders. 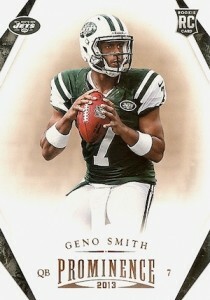 2013 Topps also features a large list of base card variations, including Geno Smith. The base card shows Smith in a throwing motion, while the variation has him tucking the ball for a run. 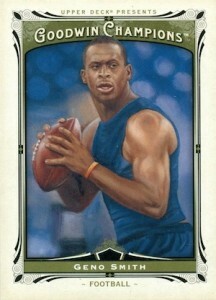 Topps Inception gave collectors the first official autographed Geno Smith rookie card. The one negative is the image from the Rookie Premiere event shows Geno Smith in a "00" jersey. Regardless, this non-numbered rookie will remain a collector favorite due to its on-card signature and nice design. Topps Platinum has a lot going on in this card, but it is not so much that it distracts the focus. 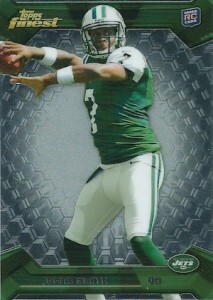 This Geno Smith rookie card includes several different elements that combine to form an interesting card. 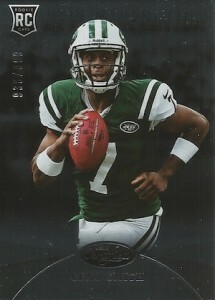 Technically a 2012 card, the 2012 Exquisite Collection Draft Picks card for Geno Smith is numbered to to 175. 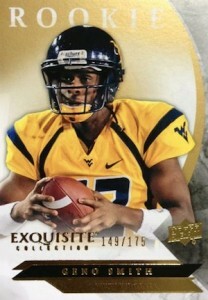 The college-themed product features Geno Smith in his West Virginia gear. 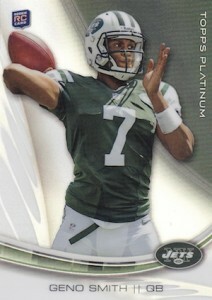 The low numbering and premium brand make this a top Geno Smith card, and one of the best non-NFL licensed cards. With a decent jersey piece, low print run and on-card autograph, Geno Smith's SPx rookie card brings a lot, which can make up for what it does not have. 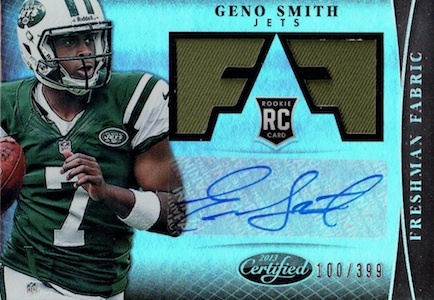 Namely, the sticker autograph and lack of NFL license hold it back from being among the top autograph Geno Smith rookie cards. 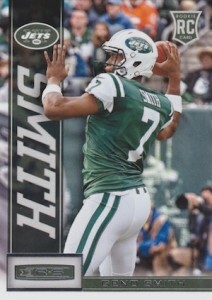 The Geno Smith card found in 2013 Upper Deck is one of the only cards, rookie or otherwise, to include an full image of Smith. It has become common to crop players at the knees or higher, and this is just a nice image alternative. There is also an SP version, but it is card number 260 and features a completely different image. Not from a football product, this card is unlikely to be featured on many top lists for collectors because of the generic unlicensed look. However, it exposes baseball collectors to different athletes and provides an almost-oddball option for football collectors. GENO SMITH 2013 TOPPS CHROME ROOKIE XFRACTOR JERSEY PATCH RC 99! MOUNTAINEERS!! GENO SMITH MATT BARKLEY 2013 TOPPS MUSEUM ROOKIE AUTO AUTOGRAPH RC CARD #4 25!